Hei, vertailin vesiväritystusseja, uusia Zig Clean Color Real Brush sivellintusseja (ylempi kuva) ja vanhoja tuttuja Stabilo point 88 kapeakärkisiä tusseja. Väritin ensimmäistä kertaa Lili of the Valleyn syksyistä tyttöleimaa. Hi, I coloured the first time this Lili of the Valley September Fairy. I was compairing Zig Clean Colour Real Brushes ( my new favourites, upper image) and Stabilo point 88 as my friend recommended them to use with water! - colours are fresh and strong, mixes easily with each others and with water and you can work with no hurry. - värit ovat raikkaat ja vahvat, helposti toisiinsa sekoittuvat ja vedellä työstettävät, eikä mitään kiirettä. - you must be quick with spreading the colour out and mixing the water, so no pen marks left. - kannattaa tehdä pieniä alueita kerrallaan, ettei paperiin jää kynän jälkiä vaan väri levittyy tasaisesti. ...and what happened for the Stabilo's, my daughter got them! I ordered some more Zig Brushes!!! ... tytär sai Stabilot ja minä tilasin lisää värejä Zig CCRB kokoelmaan, nyt on melkein kaikki!!! It's amazing how different the colours vary Mervi, the first is definitely much stronger and probably my favourite as I like the intensity of colour you have achieved on that one. 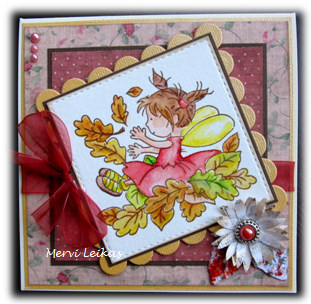 Super cards for our Autumnal theme this month, many thanks for joining in at Stamping Sensations challenge. How adorable! I think both images were beautifully colored, but it seems your experience coloring was quite better with the first image. And I'm sure your daughter was happy to receive your non favorite set. Hello Mervi, Nice to see you joining in the fun at Cardz 4 Galz. I love your fairy, the colours and design are so pretty. Caz DT. Aww, Mervi, how cute is that image! 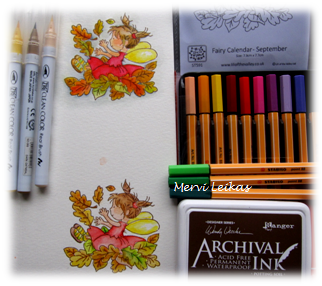 It's so interesting to see how different colouring media have a different effect, even when the colours are so similar! Thanks for joining in at CRAFT Challenge. 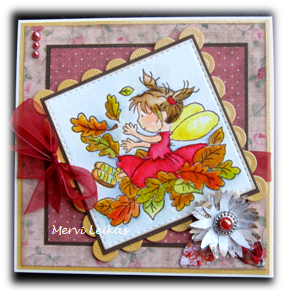 Such a lovely autumn design and just perfect for our 'Fairies' challenge at Cardz 4 Galz - thanx for playing along. Two great cards - interesting to see how the colour varies between them. Such an adorable card and lovely layout. Thank you for joining us at Fussy and Fancy, good luck and I hope you will join us again! Great to see the colour variations between the two products. Beautiful card layout. 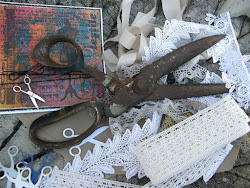 Thank you for joining the Anything Goes challenge at Lil Patch of Crafty Friends. Thank you soo much for taking part in our "Happy Fall Ya'll” challenge over at Come and Get. I'm back again, Mervi, this time to thank you for entering your gorgeous card into the My Time to Craft Challenge!